Difference between revisions of "Perovskites"
Three different configurations for a perovskite solar cell. These are only a few of many current and hypothetical cell designs. Although these materials have been known for decades, however, it has only been recently that their applications to clean energy have drawn scientific attention. In 2012, researchers first discovered how to make a stable thin-film perovskite solar cells with efficiencies over 10%, using organic-inorganic lead halides as the active (light-absorbing) layer. Since then, the efficiency of perovskite solar cells has skyrocketed. Within the last several years, perovskite solar cells have outpaced all other third-generation solar technologies in terms of efficiency, with the laboratory record standing at 20.1%. 1 What is a perovskite? 2 What applications does it have for clean energy? 3 What are some current research objectives? 4 What is the CEI’s contribution? A schematic of a perovskite crystal structure. A perovskite is a material that has the same crystal structure as the mineral calcium titanium oxide (also known as Perovskite). Generally, perovskite compounds have a chemical formula ABX3, where ‘A’ and ‘B’ represent cations and X is an anion that bonds to both. In perovskites, the ‘A’ cation is much larger than the ‘B’ cation. Perovskites have a cubic crystal structure, as represented in the diagram on the right (blue spheres represent the ‘A’ cations, black spheres represent the ‘B’ cations and red spheres represent the ‘X’ anions). Perovskite structures occur naturally as the minerals Perovskite, Loparite, and Bridgmanite. What applications does it have for clean energy? Because of their unique crystal makeup, perovskites often display a number of interesting properties, including superconductivity, giant magnetoresistance, and ferroelectricity. In addition, a large number of different elements can be combined together to form perovskite structures. This allows scientists lots of room to selectively design and optimize perovskite physical, optical and electrical characteristics. Three different configurations for a perovskite solar cell. These are only a few of many current and hypothetical cell designs. Because of this rapid surge in cell efficiency, there is hope that perovskites may soon become a cheap, highly efficient alternative to conventional silicon solar cells. The most popular synthetic perovskite, methylammonium lead iodide, has a theoretical maximum efficiency of around 31%. 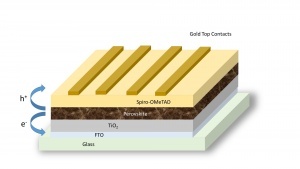 Conventional silicon solar cells require an expensive, multi-step manufacturing process that utilizes a lot of energy. Perovskite solar cells, on the other hand, can be manufactured using a simple solution deposition technique for a fraction of the cost and energy. What are some current research objectives? Because perovskites are a relatively new player in the field of solar energy, there is a lot of diverse and exploratory research being done. A lot of research is currently directed at pushing the material’s ever-increasing efficiency limits by characterizing efficiency-reducing defects and refining and optimizing the manufacturing process accordingly. Current techniques involve depositing solutions containing the material’s constituents onto a substrate and using spin coating techniques and chemical assistance to produce a thin perovskite film. Although perovskite solar cells have a lot of potential, a number of hurdles remain to be overcome before they can become a viable alternative to conventional PV technologies. First among these is the tendency of the organic compounds in organic-inorganic cells to degrade rapidly to moisture. This is currently an active area of research, and no permanent solutions have been developed. Some progress has been made in the development of polymer-based coatings that could prevent moisture entry, but no long-term studies have been made of these options. Another potential drawback is the presence of lead in methylammonium lead halides, which are currently the most popular perovskite class in solar cell research. Alternatives to lead, such as tin, are being explored, but currently these materials have lower reported efficiencies. What is the CEI’s contribution? 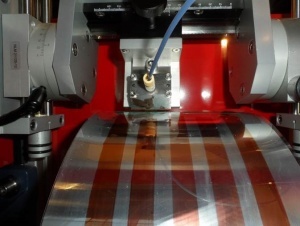 A machine using specialized inks to prink a thin-film solar cell. These materials may one day be used to achieve 31% cell efficiency. Recent work by CEI faculty has explored the possibility of creating tandem solar cells using high-bandgap perovskites. The premise of the technology is to be able to print high-bandgap perovskites onto a lower-bandgap base material (such as a conventional thin film like CIGS or a newer material like CZTSSe) in order to increase the efficiency of the cell. Alex Jen, a professor of Materials Science and Engineering at the University of Washington and the Chief Scientist for Technology Integration at the CEI, has patented “new materials and interface chemistry that allow key layers in the tandem to be printed,” while Professor Hugh Hillhouse has patented “unique device architectures that may allow these solar cells to reach 30% efficiency.” Although the high-bandgap perovskite envisioned currently does not exist currently exist, currently work is being done through combinatorial optimization on developing a new material that could work for such an application. Another recent contribution from CEI researchers in the group of Professor David Ginger has shown that some high-quality perovskite films, previously assumed to be fairly uniform, in fact have a number of microstructural defects that correspond to lower overall efficiency. By combining electron microscopy and fluorescent imaging, the CEI team was able to reveal where the perovskite was performing well and where defects lay. Instead of finding a relatively ·uniform material, the perovskite was revealed to be non-uniform, with many local defects resulting in less-than-optimal efficiencies. This new research will help scientists by helping identify and characterize new areas of improvement for perovskite cells. Many CEI faculty are working on research that directly relates or has applications to perovskite solar cells. In particular, there is a strong focus on applications of nano-scale material structuring and designing, for improved cell efficiencies. CEI faculty are also engaged in exploring novel materials for different layers of perovskite cells. The characterization of these kinds of design changes using novel imaging and sensing technologies remains at the forefront of CEI’s research thrust.